OCCAR-EA has placed two contracts with a consortium composed of Airbus Helicopters Tiger, Thales AVS and MBDA, on behalf of the French, German and Spanish Armament agencies, DGA, BAAINBw and DGAM. They aim to de-risk the obsolescence treatment of the current Tiger helicopters, as well as the implementation of new capabilities. In the frame of the Tiger HAD production contract, the first retrofitted HAP/F Standard 1 to HAD/F helicopter (Block 2) has been successfully achieved by Airbus Helicopters Tiger and delivered to French Forces on the 30/11/2017. 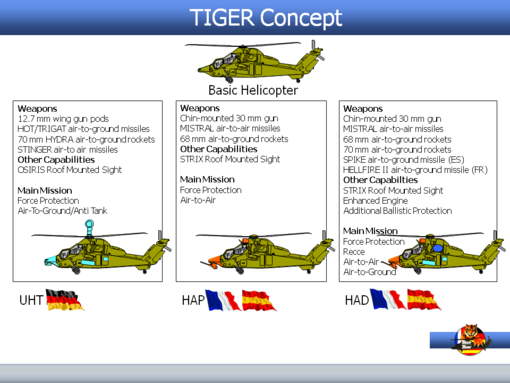 On 10 January 2017, the Computer Aided Training (CAT) upgrade for the German TIGER UHT (Unterstützungshubschrauber TIGER) reached its final milestone with the “Ready for Training” declaration made by OCCAR.